I used it for this post for WWC, and I think it sums up the last few months for me. The Internet is a funny place ... You can learn new things, find old friends, watch videos, play games, visit message boards. The sky's the limit. 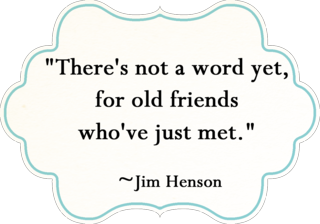 Yes, there is an UGLY side (which I won't even begin to go into), but for me, the WWW (World Wide Web) has been a huge network of friends just waiting to be met and I am grateful to meet them. I think it's my favorite thing about my job. The creative world is simply packed with great people. People who "get" your obsession with fabric, glitter and scrapbook supplies. People who know that Michael's and Joann's are not someones possession or place. People who know what you're talking about when you say CHA or QM. These are my people. And I love them. Case in point. Sweet kitty Maggie had to be put down. It was not a happy time. I have spent my lifetime owning pets, but never had to make that awful decision to put one down, and it was a heart wrenching. Plus, how do you explain to Emma, who is five, that Maggie was going to die. And what does that mean exactly? My Dad died three years before she was born, so we told her that Maggie was going to Heaven and Grandpa Val would take good care of her. So one night I got a message on Twitter from my friend April Meeker. We had met briefly in the summer at a blog conference, but only really "know" one and other from the Internet creative world. She had a gift for me and needed my address. Emma answered and wanted to open it right away. "Hey! Did Grandpa Val send this to me?" she asked. I laughed, then I cried. "No, my friend April did to make us feel better". We sat down to read the book and I tried my best to hold it together. It is a BEAUTIFUL book ... If you ever loose a pet (there is a Dog Heaven as well), you must get it. How sweet is that? I envision that those who have gone on to Heaven like to make sure that we are ok, and I can't help but think that Maggie and My Dad check on us often. It makes me feel at peace. Thank you April for this gift. I really can't express how much it meant to me. Please visit her today ... You'll be glad you did! Well, I am off to break up the band downstairs. Now add Colter's electric guitar and Bruce's old electronic keyboard and you have a very LOUD house. I so understand what you mean about blog friends...they DO get it...it's a beautiful thing! What a sweet gift from your friend...so glad it helped. Such a sweet post. I agree, the ones who "get" us are ones we may never meet in person (in my case---I live in very rural area!). The book sounds perfect. My bro. & sis-in-law just lost their little dog (they have no children) and are heart broken. 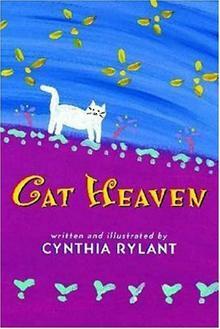 I'll look for the "Dogs in Heaven" book now. Drums for your 11 y/o? You're in trouble, but you're also awesome to let him get started in music! (ear phones for you, let him pound away after that!). Oh my sweet friend..what a lovely post...such a thoughtful gift..I can so relate as we had to put a sweet pet down a while back...one of the hardest things to do. What a sweet friend to send that to you! I agree about blog/internet friends. We get to share our passion in a way that our everyday friends don't get to see us. You are darling Paige, I'm lucky to know you. Thank you Paige for posting this information. I have a golden retriever (11 years old) that is having seizures due to a brain tumor. I am going to have to put her down soon and am just enjoying the time I have left with her. Autumn has been part of our family since she was a little puppy. I will buy this book to help me and the kids cope with her loss.